Anyway, I went to the Pangong lake! It was crazy! Beyond words! Ga sabar deh mau pamer foto2nya! Haha. Btw, Dalai Lama is in here in Ladakh! Tapi ga bisa diketemuin, soalnya dia mau meditasi aja selama 4 minggu! Haha. Hope everything is fine w/ you. Miss you baby! Some people said that if you have yet to visit India, you haven’t see the world. Now, after receiving this postcard I know the reason why India has to be in my top priority of bucket list, especially for Ladakh, Tibet, and Himalayas area. 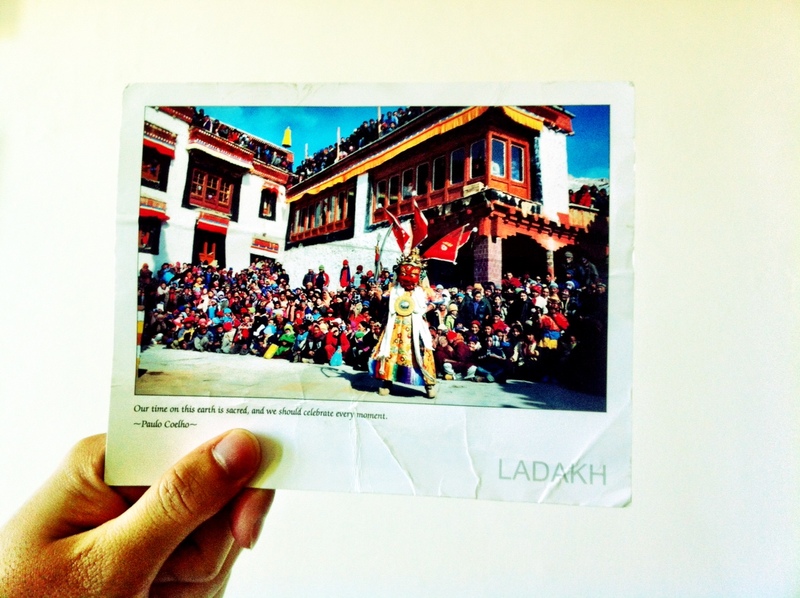 From Ladakh, where this postcard came from, I want to see Pangong lake, the lake that Miska mentioned in her postcard too. You can find the reason through below picture, taken by Miska with her Oppo Phone. Pangong Tso, Tibetan for “long, narrow, enchanted lake”, also referred to as Pangong Lake, is an endorheic lake in the Himalayas situated at a height of about 4,350 m (14,270 ft). It is 134 km (83 mi) long and extends from India to Tibet. Approximately 60% of the length of the lake lies in Tibet. The lake is 5 km (3.1 mi) wide at its broadest point. All together it covers 604 km2. During winter the lake freezes completely, despite being saline water. 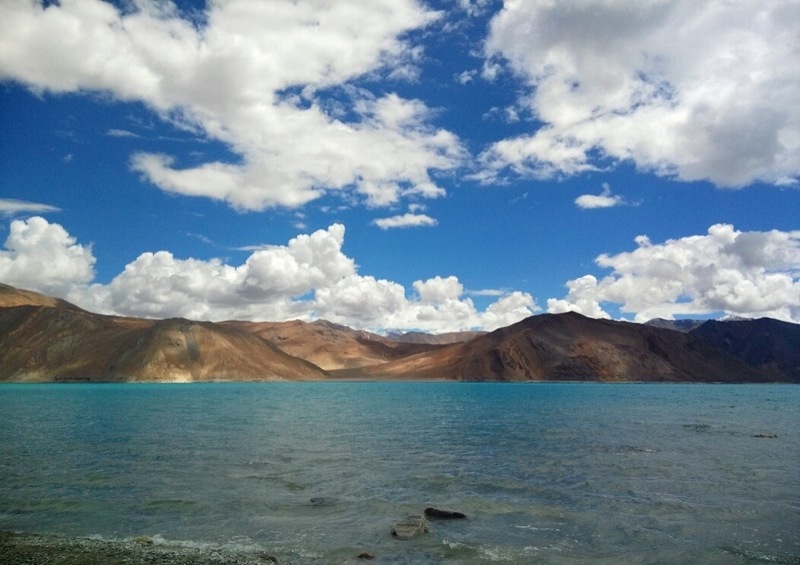 Pangong Tso can be reached in a five-hour drive from Leh, most of it on a rough and dramatic mountain road. The road crosses the villages of Shey and Gya and traverses the Changla pass, where army sentries and a small teahouse greet visitors. Road down from Changla Pass leads through Tangste and other smaller villages, crossing river called Pagal Naala or “The Crazy Stream”. The spectacular lakeside is open during the tourist season, from May to September. Is that all? No. 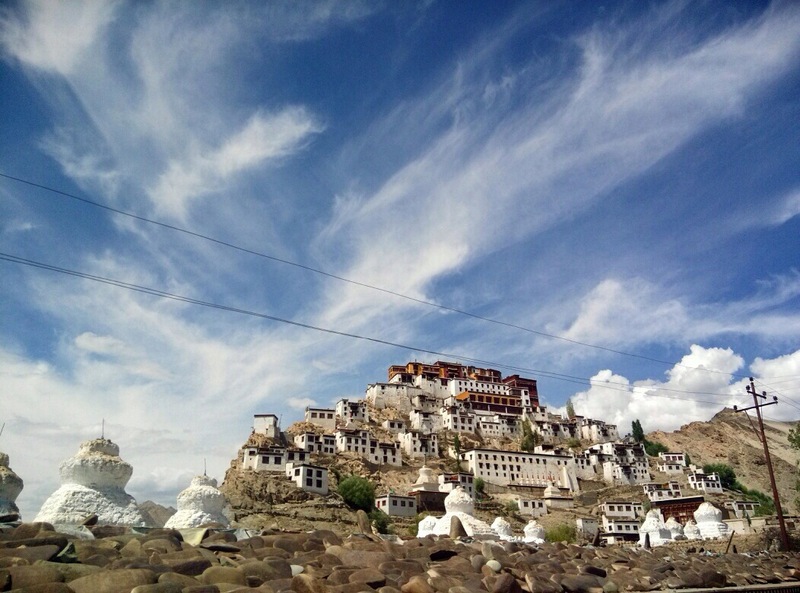 Ladakh is also famous with its monasteries. One of them is Thikse Gompa or Thikse Monastery. Below is its picture, still taken by Miska with her Oppo Phone. What Wikipedia said about Thikse Gompa? The monastery is located at an altitude of 3,600 metres (11,800 ft) in the Indus valley. It is a 12-storey complex and houses many items of Buddhist art such as stupas, statues, thangkas, wall paintings and swords. One of the main points of interest is the Maitreya (future Buddha) Temple which is installed to commemorate the visit of the 14th Dalai Lama to this monastery in 1970. A 15 metres (49 ft) high statue of Maitreya, the largest such statue in Ladakh, covering two storeys of the building is deified in the monastery. A nunnery is also part of the complex. Hope to visit Ladakh one day! Thank you Miska for sharing this with us. If you want to see more pictures from Miska’s trip to India, take a look on her instagram account @miskalail.